One of the more challenging things about writing a book set in the past is trying to imagine a modern city (especially one that I know personally, like New York or Philadelphia) the way that Eliza and Alexander Hamilton would have known it. Busy urban landscapes change by the week, let alone the century. Visiting historic sites is a wonderful gift to my imagination, but when a colonial building is now surrounded by high-rise buildings, complete with the noise of cars, trucks, and buses, it's not always easy to picture life in the same place nearly 250 years before. I recently came across this wonderfully detailed painting of Philadelphia in 1776 at the beginning of American Revolution. At the time, Philadelphia was the largest city in the new United States, with a population of around 40,000, and it continued to grow after the war, particularly while serving as the new country's capital. 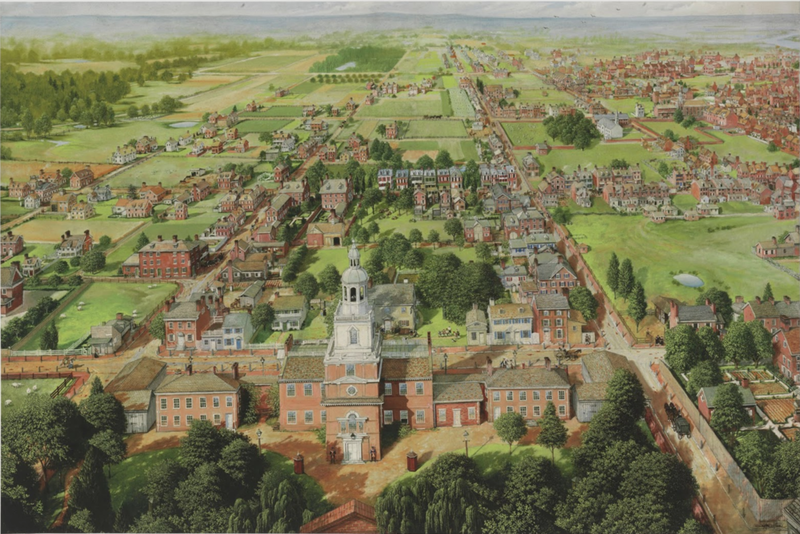 The work of modern artist Paul MacWilliams, this painting shows Independence Hall when it was still called the State House, a most imposing building standing over a city that still had plenty of trees and green space. Most of the city's commercial buildings were clustered around the docks on the Delaware River, which can be glimpsed at the top corner, and would have continued just beyond the right edge of the painting. All of this would have been familiar to both Eliza and Alexander Hamilton. Their various lodgings would have been to the east (the right in the painting) of the State House. Despite being large by early American standards, the city was still easily "walkable", and the distance between the Hamiltons' rented houses and the government offices where Alexander was employed was never more than a handful of city blocks. Churches, the city market, playhouses, taverns, and shops were also conveniently nearby. "Mr. MacWilliams, who holds a degree in illustration from the Philadelphia College of Art (now University of the Arts), used late 18th century Philadelphia maps, prints, and other visuals to research the landscape of the city looking north from Independence Hall. He also read through John Fanning Watson’s Annals of Philadelphia to gain a better understanding of life in the colonial city. Outbuildings, gardens, even horse droppings in the street are meticulously rendered in his work which took three years to paint." Above: "Pennsylvania State House, 1776" by Paul MacWilliams, 2011, private collection. I'm guessing that Alexander and Eliza would agree.